We define poverty, I suppose, as that living condition which is unable to acquire enough dollars to purchase some, or most, of the basic necessities of life. It also seems to be an accepted notion that a certain amount of “poverty” is a necessary condition of our modern market economy—that a certain segment of the population will always be “unemployable” by the profit-oriented business community, either because they lack skills or because the business community simply does not need their services in order to generate its profits. Nobody really knows what to do with these “unneeded” people. We talk about “retraining” them—but there is no guarantee the profit-seeking business community will need them even with their newly acquired skills. In the meantime, these “unneeded” people don’t know what do with themselves either. This is, perhaps, the biggest problem of all—though I will not, in this short essay, go into the details of that (except to say that it is contributing to a tragedy that is now disrupting the lives of too many of us). The point is this: It is time to begin imagining specific, concrete solutions to what is becoming a fundamental dilemma of our time. NEP’s Marshall Auerback interviews Branko Milanovic, Visiting Presidential Professor, The Graduate Center, City University of New York. This is almost certainly the highest level of relative, and certainly absolute, global inequality at any point in human history. Is there anything we can do to reverse or mitigate this trend? See the interview here. This year marks the 50th anniversary of the so-called “War on Poverty” that President Lyndon B. Johnson declared when the official poverty rate was at 19%. Five decades later, the poverty rate stands at 15% with 46.5 million people living below the official poverty line, which is about $23,000 for a family of four (2012 Census Data). More than 20 million people earn less than half the poverty line, in other words, they live in extreme poverty in the richest country in the history of the world. The statistics are even more depressing when we consider that the child poverty rate (under age 18) is an alarming 21.8%. Even worse, for children under the age of 5, some states register poverty rates of up to 36%. Should anyone—the state or any other source–have an obligation to interfere with you to bring your best, flourishing, self about? Certainly, this is the debate that philosophers such as Isaiah Berlin and libertarians such as Robert Nozick have engaged in heartily, with a view to socialist frameworks that redistribute resources in order to produce selected kinds of outcomes. Should the state impose certain ideals and goals upon you, and why? There are also numerous examples of good state-imposed expectations such as seatbelts or prohibitions against drunk driving, as well as terrible examples, such as state-imposed prohibitions on certain kinds of drugs. In a neoliberal era, the corollary to above question is whether non-state organizations should have the ability to interfere with you in order to bring your best, flourishing, self about? The New York Times told two separate stories earlier this week, with no apparent recognition that they might be related. On September 12, David Brooks published a column decrying the moral “relativism and nonjudgmentalism” of the young. On September 13, a front page story announced that “Soaring Poverty Casts Spotlight on ‘Lost Decade,’” explaining how the economic decline of the bottom half of the population over the past decade has grown worse during the financial crisis. What do the two stories have to do with each other? Brooks writes as though the country has – or should have – a set of shared values. Yet, he ignores class and cultural differences in the way values are formed and expressed. In doing so, he fails to address the most critical question the country faces: how can we maintain a sense of shared values when the institutions that support one part of the country flourish at the expense of those critical to the part of the country in decline. In short, the decline of the middle class and the soaring poverty rates the second story describes are far more significant issues than anything in Brooks’ column. Brooks misses the connection between the two because he conflates a centuries-long phenomenon – the development of modernism — with more recent changes that are appropriately a source of concern: the decline of community. Studies of the difference in values between modernists and traditionalists emphasize, as does Brooks, the importance of community. These researchers find that traditionalist communities, whether they consist of specific church groups, developing world nations or working class neighborhoods, tend to be characterized by close kin networks, while modernist communities have networks more likely to be defined by something other than blood ties. These differences mean that the source and content of moral transmission varies: modernists tend to rely on individualized internalized values transmitted within private networks while traditionalists depend more on the health of institutions that articulate and reinforce pubic values. In the United States, the differences between kin based traditionalist networks and individualistic, modernist ones tend to be strongly associated with class. In the Italian-American community of my youth, for example, my father simply moved in with my mother and grandfather when they married. We lived next door to an aunt and uncle. Another aunt and uncle and three of their four grown children lived on the next block. My mother spoke to her sisters every day. I never had a babysitter to whom I was not closely related. And we all attended the same church. I realized only as an adult that while we all identified as Catholics, our views ranged from deep devotion to profound skepticism. Yet, we were imbedded in close-knit family networks that tended to reinforce Catholic teachings about acceptable behavior. All that changed when my cousins and I attended college far from home. We have each made individual decisions about what church to attend and what identities to embrace. I have had far more intense discussions about my moral and philosophical views with my college-educated colleagues than I ever did with the family members or co-religionists of my youth. The discussions occur in part because we do not share the same assumptions about the source of values. This selection, articulation, and promotion of individual values takes more effort than my home community’s allegiance to a particular religion or ethnicity. It also requires respect for the views of others. The ability to combine strong individual values with tolerance in a diverse society is what education for democracy means. It is a critical legacy of the Enlightenment and the foundation of modernist societies. In contrast, traditionalist approaches, which rest on morality that is “revealed, inherited and shared,” require strong institutions. Institutional leadership, rather than individual virtue, is necessary to combine group allegiances with public tolerance and to mediate the tensions between group interests and membership in a broader society. What Brooks doesn’t tell you is that the real crisis in contemporary American society is the weakening of the institutions that serve those on the losing end of the American economic ladder. One of the startling observations in the Moynihan Report of the mid-sixties was his finding that as jobs disappeared from rustbelt inner cities so, too, did church attendance. A half century later, Brad Wilcox has found the same thing among the working class more generally. With economic decline that has disproportionately affected traditionalist America, the institutions that produced cohesive communities, including churches, schools, families and civic organizations, are in decay. Modernity with all its faults, however, is not the principal source of the problem. And the risk Brooks does not acknowledge is that attacks on modernity in the name of morality often become attacks on tolerance. Let’s address the real sources of institutional decay and stop conflating the challenges of the last few years with the cultural changes a millennia in the making. A recent report on the State of America’s Children revealed distressing statistics. More than 1 in 5 children live in poverty in the U.S., by far the most impoverished age group in the nation. Between 2008 and 2009 child poverty jumped 10%, the single largest annual jump in the data’s history. 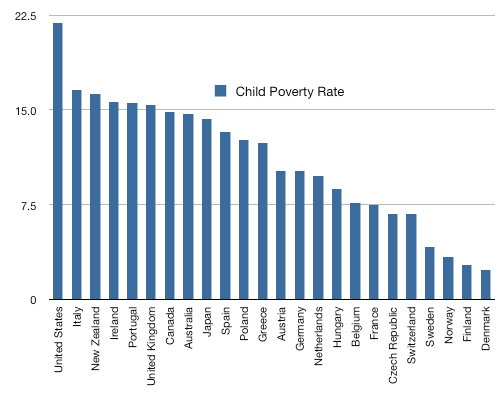 While the U.S. is the wealthiest nation in the world in terms of GDP (and # of billionaires), it ranks last in relative child poverty among all industrialized nations. Overall we have 46.3 million people in poverty in the U.S. (the largest number in the postwar era), which is 14.3% of the total population—a percentage that has been trending up since 2000.